The United Nations Convention on the Protection of the Rights of All Migrant Workers and Members of Their Families was signed by only 36 countries, all of which are primarily immigrant-sending countries. Migrant rights, it would appear, is not a high priority for most immigrant-receiving countries, which instead struggle to implement immigration policies that address their specific security, economic, and cultural concerns. Despite the work of pro-immigrant activists, rarely are the human rights of immigrants at the forefront of domestic-policy makers’ minds. 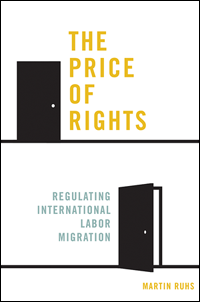 A book published earlier this year, The Price of Rights: Regulating International Labor Migration, addresses the tension between, and motivations behind, rights for migrants and state interests. Martin Ruhs, lecturer in political economy at the University of Oxford argues for the middle ground between state interests and immigrant rights. To be clear: Ruhs is not anti-immigrant, nor anti-immigrant rights. Rather, he argues “for a pragmatic approach that is both realistic and idealist” (20). He asserts “…we cannot hope to close the gap between human rights… and migrant rights in practice unless we understand as well as account for the reasons why nation-states grant and restrict certain rights” (16). Ruhs’ work focuses on the space between the rights of the individual and the interests of the state; the careful balance between maintaining rights and enabling access to the economic market. Where Ruhs’ work gets interesting, is how he suggests countries tackle these rights restrictions. Rather than an outright banishment of any rights restrictions, which could in turn restrict their movement and subsequent economic opportunity, Ruhs argues to allow for some rights restrictions – with caveats. Any rights restrictions should… be limited to the right to free choice of employment, equal access to means-tested public benefits, the right to family reunion, and the right to permanent residence and citizenship. Rights restrictions need to be evidence based in the sense that there must be a clear case that they create specific costs that the receiving country wishes to avoid… to enable greater openness to admitting migrant workers… I also hold that any rights restrictions should be time limited… After this period, migrants need to be granted access to permanent residence (and thus eventual citizenship) or be required to leave (21). All this is, as Ruhs said himself, very practical. His suggestions would make an interesting and potentially fruitful compromise between the state and individual rights – if ever actually applied to policy. What stands out as problematic is the idea that a country could ever enforce such a potentially large number of people to leave at the end of any temporary program. The United States has an estimated 11 million undocumented immigrants and an estimated 40% overstayed term visas. More subtly problematic is the underlying assumption that a country would care enough about the rights of a non-citizen to make the compromise in the first place. What is the motivation of the state to compromise at all? That being said, in many ways, Rhus’ work is an excellent reality check for idealism within the immigrant advocacy community and a solid discussion on the rights of migrants and the trade-offs of policy decisions. It’d be a good addition to a graduate or higher-level undergraduate migration course reading list, or to the bookshelf of an academically minded policy maker.